Thanks to all readers who took part in the earnings and savings poll. The results make for some very interesting reading but before we go there let’s just take a second to review what we were really looking at with this poll. Save Hard is how we go about building capital that we can then deploy to investments that hopefully with time will give a return on that capital. For me, and I'm sure many other readers, that is earnings from the day job that aren't spent on living today. Invest Wisely is how we go about maximising the return on the capital we've built from Saving Hard. For me that’s a balanced portfolio of different asset classes invested as tax effectively and at as low a cost as possible. 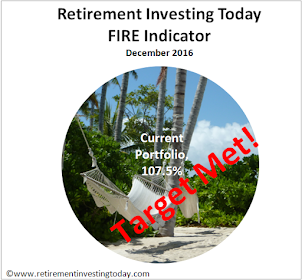 Retire Early is how big the capital pile needs to become before the goal is achieved. 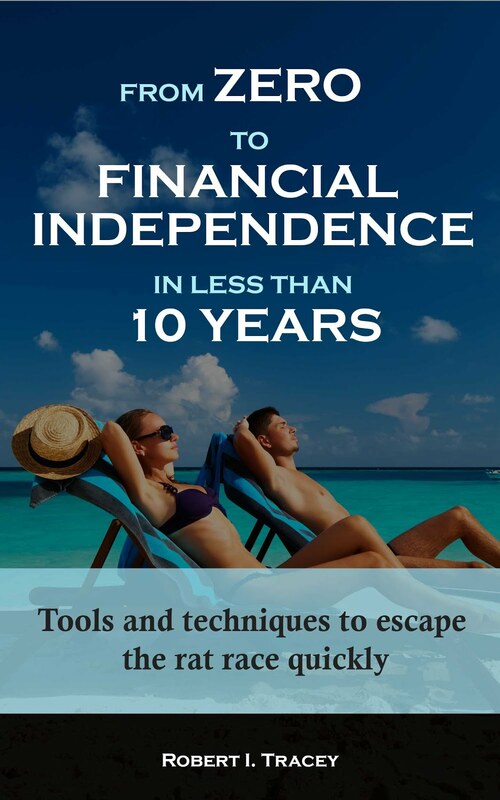 For me I’m chasing enough wealth to be Financially Independent and have the option of Early Retirement but there are many other reasons why we might want to build capital. Having a Retire Early reason is important. Without it there is no reason to build the capital in the first place and you’re probably then just hoarding. The polls were really looking at the Save Hard portion. The first question asked was what are your gross annual earnings? The results are surprising particularly when I chart them below against UK individuals who have some liability to income tax. The surprising part is just how much we all earn. For example 19.4% of us earn more than £100,000 a year! In the UK that puts those readers in the top 2% of UK tax payers. The median reader earns between £40k and £50k per year where across the UK median earnings are only £20,300. 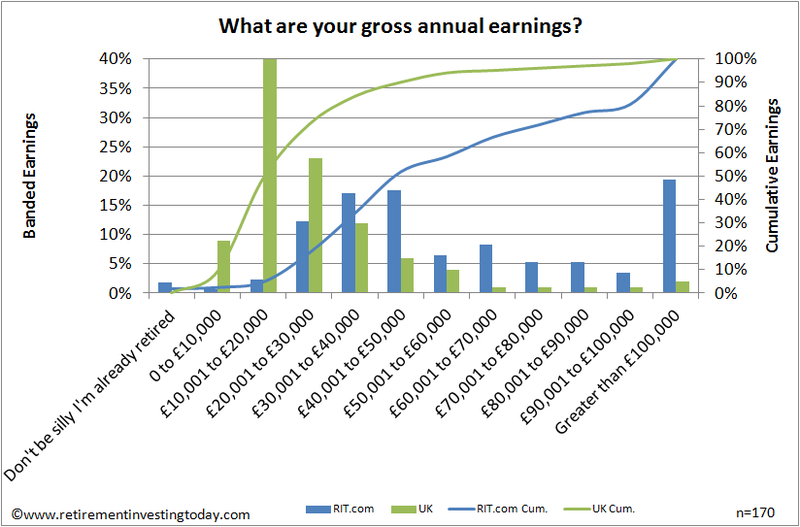 A RIT.com median reader is earning somewhere between 2 and 2.5 times that of the UK as a whole! The mode of readers is also £40k to £50k however across the UK it is only £10k to £20k. These high earnings then give us all a fantastic chance to save if we live below our means and we don’t disappoint there. 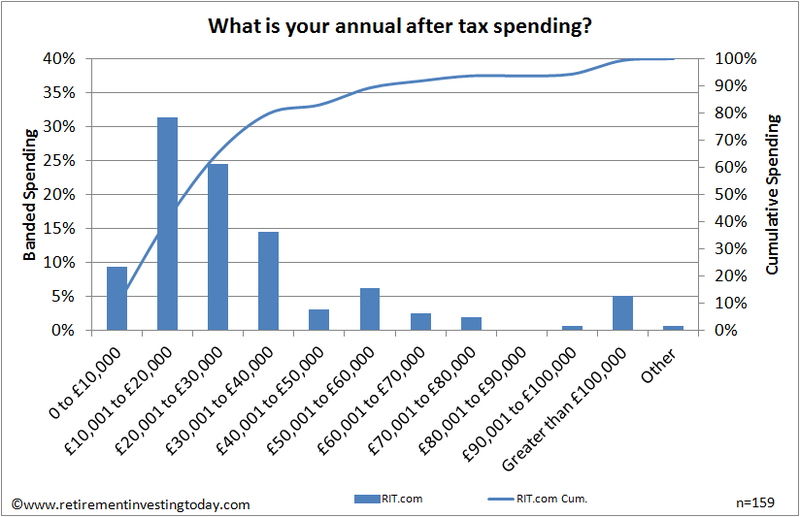 The second question asked was what is your after tax spending? The results are in the second chart which definitely shows us living below our means. Here our mode drops to £10k to £20k and our median is somewhere between £20k and £30k. In the post that inspired this poll I made the hypothesis that our Average Jane might earn £40k and consider living on £10k. Compared to the majority of readers it looks like she’s a little light on earnings with 65.9% of us earning more than £40k but the £10k spending was actually probably a little light given only 9.4% of us live on less than that. Jump to £20k of spending however and all of a sudden you’ve covered the spending of 40.9% of us. So given our high earnings and modest spending just how much are we saving? This was the third question which asked what is your annual savings rate. Here I was thinking I was blasting a new trail with an annual savings rate of 55% of gross earnings but it appears I’m not even close to being alone. 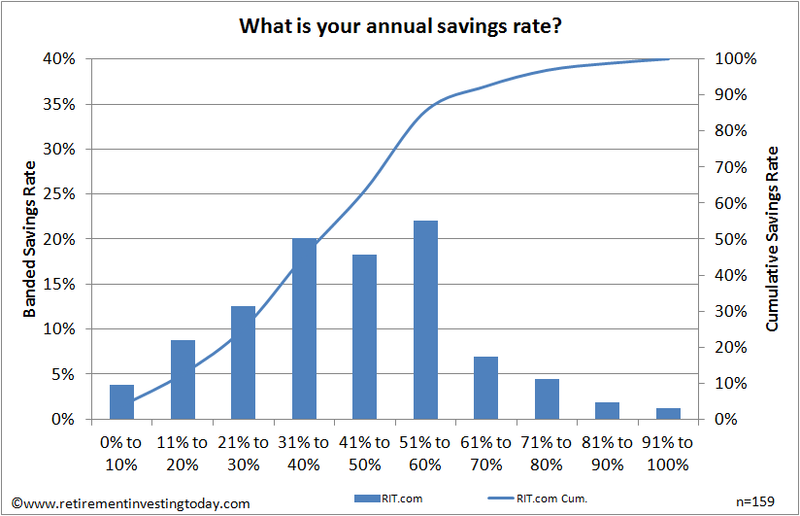 36.5% of readers are savings 51% or higher and 60.4% of readers are savings between 31% and 60%. So how does that compare to the UK average? Information online is pretty scarce but the latest NS&I savings survey suggests on average the UK is saving 7.6% of earnings. On top of that you need to add pension contributions where the Pensions Policy Institute tells us that on average if we’re fortunate to have a Defined Benefit Pension then we’re saving 20.2% of earnings and if like me you’re enrolled in a Defined Contribution Pension then the average punter is only saving 9.7%. Summing these (which is a little bit of a stretch) gives total savings of either 27.8% or 17.3% depending on your pension type. We as a collective are miles ahead of that with 74.9% of us saving more than 30% and 87.4% saving more than 20% of our earnings. I guess I shouldn’t be surprised by any of the results given the nature of this site. What conclusion to make from all this... On the average we’re anything but average? Thank you for conducting these savings. The results are fascinating, and I'm surprised like yourself how high the RIT reader earns on average. The saving rate was a little more predictable. Those two figures combined were slightly surprising to me because I thought a higher salary would result in a higher saving rate. More disposable income, but when I step back and consider it, I'm sure if you're £100k a year or £20k a year, you still face the challenge of how much money you want to spend. The more money we earn the more money we have to spend. Thank you again for sharing these numbers! I think tax also has a big effect on savings rates once you get higher earnings as we're talking gross numbers here. Once you hit Higher Rate tax the most you can save is 58% because you're losing 40% in tax + 2% in NI. Then once you hit a £100k for a period you're down to a maximum savings rate of effectively 38% because you have 40% tax + 2% NI + £1 in every £2 of lost personal allowance (giving effectively an extra 20% in tax until you've lost all your personal allowance). As a Higher Rate tax payer it's one of the reasons I salary sacrifice some of my savings into a pension even with all the risks of government tinkering. Thanks for running these polls. The percentage of high earners surprised me too but people on all kinds of wages want to find out how to achieve FI. As Huw says, high wages often = high spending, so savings rate could be affected. Interesting stuff - I hope you plan on doing more polls! How many responses in toto on which these percentages are based? Good point. I should have mentioned in the post that the respondent count to each question is shown in the bottom right of each chart. n=170, 159 and 159 respectively. Thanks for amending (totals now showing at top). A respectable number for analysis. Its not really very surprising, the early retirement option has always been realistic to the higher earners. By definition this section are more interested in monetary reward and many of them will be strongly motivated to save it. If you earn a lot, save a lot, then what do you do when you have enough to last the whole of your life? You retire but continue to save modestly and Invest prudently to cover potential care costs and help your kids with a stash. At least, that's what I'm doing after retiring twelve years ago.